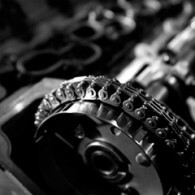 If you are unsure wether your engine has a timing chain feel free to phone us on 0115 926 8368 we will be more then happy to assist you. - Sluggish performance and poor economy. - Sudden engine performance change including the inability to start the engine. - Intermittent backfire through the intake manifold. - Inconsistent ignition timing or a clattering noise coming from the front of the engine.